I came across Weightless today in Experience Weightlessness. The value in machines having wireless communications has long been understood and a large market is predicted for many years. That this has not transpired has been because of the difficulty of meeting all the requirements within the constraints of the available radio spectrum. These constraints changed significantly with the advent of white space availability which provides near-perfect spectrum with free access. However, the combination of the unique and unusual nature of that access and the very different characteristics of machine traffic compared to human traffic means that using any existing standard is far from optimal. Hence, the need for a standard designed specifically for machine communications within white space. Weightless technology has been optimised for this specific scenario and is now being delivered as a royalty-free open standard. For more details see Weightless (wireless communications) or Weightless SIG. I see that the SIG is having its first meeting tomorrow according to First Weightless Plenary Conference! 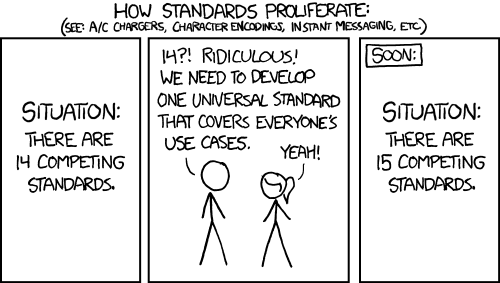 Apparently today was World Standards Day! I did not know such a thing existed, until a colleague told me about it this morning! 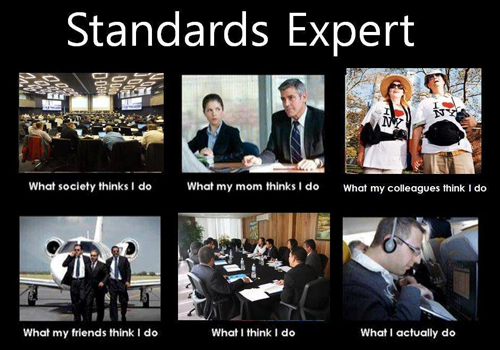 So happy World Standards Day! In fairness, it is very true! I have been made aware (thanks) of some interesting web client-server developments recently, so I will group them all together in this post! Do you find HTTP too slow? Then you might want to try SPDY! I am actually really impressed that it is already in use in Chrome! For more details see Life beyond HTTP 1.1: Google’s SPDY. Are you developing a web site with sensitive information? Then perhaps you should consider HTTP Strict Transport Security (HSTS)! See Strict Transport Security and Public Key Pinning for more interesting details! Actually, after reading DPI Doubts Deepen recently I am more convinced than ever of the need for using security! Finally, do you need to classify all of the APIs that you use? Yes – then look at Classification of HTTP-based APIs. There are a lot of exciting developments there! I read today that the W3C will stop developing XHTML 2 later this year, and it will focus on HTML 5. I have not had direct experience with either of these standards. However, I have been using XHTML 1.0 and XHTML 1.1 for a long time for my personal web pages (including these web pages). The full article is An epitaph for the Web standard, XHTML 2, and the official W3C announcement is XHTML 2 Working Group Expected to Stop Work End of 2009, W3C to Increase Resources on HTML 5. I read an article during the week describing how several of the major mobile phone manufacturers have agreed to develop a standard mobile phone charger for use throughout the EU! I think that this would be very useful, and I am surprised that I never thought about this before now! The original article that I read is All change for mobile chargers. I wonder what other aspects of consumer electronics could be standardised. The most obvious one that I can think of is laptop chargers. Skype currently uses a propitiatory protocol to exchange VoIP data, and this protocol masquerades as HTTPS. SIP is a mature open standard for VoIP, and therefore there are already many compliant hardware and software solutions. If Skype can successfully incorporate SIP functionality without compromising on the existing propitiatory protocol over HTTPS then I think that would be a great solution!